I thought that posting the above chart would be a nice way to begin Bike Week. 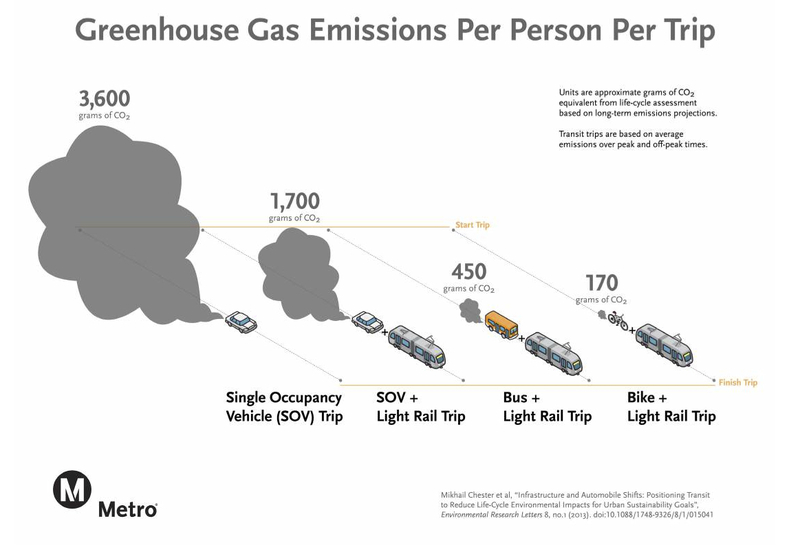 As the chart neatly shows, taking transit can be an effective way to reduce greenhouse gases — especially those who bike or walk to and from light rail stations. It makes sense: no fossil fuels are needed to power your legs. The chart is from Metro’s First Mile/Last Mile Strategic Plan that was adopted by the Metro Board of Directors in April. Greenhouse gases, of course, are the primary agents for climate change. As the amount of carbon dioxide and other gases from the burning of fossil fuels increases in our atmosphere, the planet is growing warmer. Here’s a good explanation of the basics from the U.S. Environmental Protection Agency. The reduction of important topic given how much climate change has been in the news lately. The White House released a report last week on the ongoing impacts in the United States from climate change, including warmer temperatures, increased rains and flooding in some areas, drought in others and more intense wildfires and tree die-offs due to insects. The report followed one by the United Nations released in March that found the same phenomenon on a global level. There are some important caveats when it comes to figuring out greenhouse gas emissions from transit. One involves how a project is built. It helps to have a green construction policy to help curtail pollution from trucks and other heavy equipment (and Metro does have such a policy). Even more important: the number of people riding a train or bus. The more people riding, the more efficient buses and trains are. (See this Duke University study comparing passenger per mile emissions from a bus getting 2.33 mpg versus a car that gets 25 mpg). Metro’s numbers are based on a study looking at the Gold Line and Orange Line published in the academic journal Environmental Research Letters in 2013 by researchers from UCLA, Arizona State University and UC Berkeley. The Federal Transit Administration in 2010 also published a useful guide to comparing greenhouse gas emissions from cars and public transit. The FTA’s work shows that heavy rail transit (typically subways such as Metro’s Red/Purple Line that use bigger, heavier trains) are even more efficient than buses and light rail, due in part to heavier ridership. Of course, such comparisons depend on the type of car. The average car and light truck in the United States in 2012 averaged 23.6 miles per gallon. As many of you know, some hybrids can double that and that’s an important consideration. About two percent of the cars in California are hybrids, according to the DMV — although that percentage is likely higher here in Southern California where many of you reading this likely have invested in a hybrid. Obviously, this is not a controversy free topic. While there is widespread consensus about climate change among local, state and federal governments in the U.S., only 44 percent of Americans believe there is “solid evidence” that the Earth is getting warmer, according to the New York Times (Latinos and African Americans are more likely to believe in global warming and see humans as responsible). Some people do not believe climate change is occurring or, if so, they do not believe humans are responsible and that climate change is part of the Earth’s naturally occurring changes. This is a point I’ve tried to hammer home on the blog over the past few years. Transit and walking and biking may not be a panacea for climate change. But there is substantial evidence that a person can reduce the greenhouse gases that they are responsible for by taking transit. Here’s the question that I’m most interested in: how transit agencies use climate change in their marketing and public relations efforts. Metro, for example, has for years promoted transit as a way to reduce fuel consumption and help battle our region’s smog problem. And the agency has hardly shirked from promoting its green initiatives, which include converting its entire bus fleet from diesel to compressed natural gas vehicles, increasing the use of renewable energy to the massive and the ongoing Measure R program that includes 12 transit projects (with three rail lines under construction with two more on the verge of starting work). But that’s a little different than marketing campaigns that explicitly mention global warming, climate change and the many impacts that are expected. So here are my question readers: would that be appropriate outreach for a transit agency? Is that something you would like Metro to do or not? If so, why or why not? Thanks for reading and one comment per customer please! How much greenhouse gas is released from an average motorcycle or scooter? There are an increasing number of those who are foregoing both the car and public transit for two wheelers these days. Sure. But that doesn’t mean jacking up fares will be a good incentive to convince more people to take transit either. Costs are an important factor in consumer choice. Who is going to spend $2.25 to go to the nearest supermarket over a car which is cheaper at that short distance? To a certain extent yes, there is a validity to it. But, environmental issues plays only a small part to convince more car riders to take transit. The other missing major factor is cost. When people make changes, cost is a bigger factor – what does it do to the people’s wallet, both in the short and long term. For example, take the “switch to paperless statements” that many billers say to “help save the environment.” Do you think they do that because they really care about saving trees? No, it’s because they can save on costs. The more people switch to paperless statements, less cost in buying envelopes, paying for postage, and saving ink and toner to send them out. When people switch to energy efficient lighting like CFLs and LED lightings, do you think they do that to help save the environment? No, they do it because the long term savings of switching to lower energy lights helps save them electricity costs in the long term. What is the cost to switch to Metro? Sure it’s greener, but is it really cheaper for people’s wallet? And no, it’s not just comparing a gas powered car over public transit, there’s now the comparison between the cost of hybrid and all electric vehicles to going Metro, as well as the the cost comparison of owning a motorcycle to going Metro as the first poster mentioned. More motorcycle shops are popping up all over LA and that is a factor that cannot be overlooked – why are people switching to motorcycles instead of Metro? I say no. Metro’s current campaign appeals to individual self-interest and is, in my opinion, being as green as possible and attracting people who are mainly interested in saving money or increasing convenience, without alienating the anti-climate-change drivers. Even if Metro somehow convinces everyone in LA to go Metro, does Metro even have the resources to handle 10 million LA County residents on public transit? The other comments above are excellent points all. Cost IS a major factor in the decision. Those who “believe in” climate change already KNOW that their choice to ride the Metro, or not, will impact the atmosphere and the planet. So why do they choose not to use the metro, to use their personal vehicles? Convenience, and ease of transporting goods. Those are technological issues–but your question is one of marketing. Here’s a thought: because cost is a factor, perhaps Metro could find a way to decrease the cost on a per-use basis? Take the Metro once, pay $2.25. Take the Metro 6 times in a month, pay less each time until the average cost is $2.00. Take the Metro 30 times a month, pay $1.25. Or some variation on that idea–make FREQUENT ridership a financial boon. No duh cost is an important issue to people. Why do you think the honor system failed? Because free is cheaper than paying! I’m with everyone else here. It’s already a no brainer that taking public transit is better for the environment. You don’t need to waste taxes on educating the public on something they already know. It’s like spending money on ads that smoking is bad for your health when everyone knows this already and it doesn’t take much to Google the health risks associated with smoking. The question Metro should be asking is why then people still stick to driving? And it’s not because of lack of education in tree hugging issues. The underlying reason for that is cost and convenience. As one of the posters mentioned, if the fare increase happens, no one in their right mind is going to spend $2.25 just to go their neighborhood supermarket to buy groceries. Spending $2.25 to go from Santa Monica to Downtown LA, now that’s a bargain. But $2.25 to go down a few blocks to buy milk? People will just drive. Let alone no one is going wait under this hot sun to wait for the bus to come just to go buy groceries. The car is also just too convenient. How many bags of groceries can one bring along the bus as opposed to putting it into the trunk of the car? If you buy ice cream and spend 20 minutes waiting for the bus under this heat, it’s just going to melt. How many cans of soda can you bring along the bus as opposed to just plunking five 12 pack cartons from Walmart into the trunk of the car? Can people bring aboard a roast chicken and other items from Costco onboard the bus as opposed to stashing them into the trunk? If Metro is wondering why people aren’t switching to public transit, those are the answers. This entire region was built with the car in mind. You don’t have supermarkets and retail stores within a reasonable walking distance to where people live. No one is going to spend $2.25 just to go to their neighborhood Staples, Ralphs, Vons, Carl’s Jr., Starbucks, etc. etc. People drive to get to these places. These places are too far to walk, but short enough and more convenient to go with the car, but not worth it to pay $2.25 on a bus to go there. Everyone knows that the car is bad for the environment. But the car is just too convenient and more cost effective to get things done fast than public transit. What LA really needs is a massive reconstruction of this city to make this place more denser. Zoning laws have to be changed all across LA County to allow for multiuse buildings. Massive amounts of homes, businesses, and apartments need to be demolished for a more walkable, transit friendly environment. But face it, that’s not going to be cheap and it’s not going to happen overnight. And until then, people will continue to stick with cars. At best, they’ll downgrade to a moped or something. But they’re not going to take public transit.